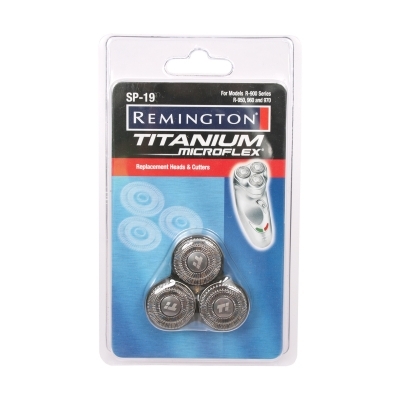 The Remington SP19 Titanium Mircoflex shaver head & cutter pack is the genuine replacement for all Remington Microflex, Mircoflex TCT and Titanium Shavers. We don't stock this item, but we can order it for you. The inner and outer cutting rings are designed to increase the speed and efficiency of your shave. The Remington SP19 shaver head replaces the SP-16 shaver head and is compatible with the same models. To ensure the best shave it is recommended that you replace your heads and cutters every 2 years.